DIY decorating is appreciated by people worldwide because of the high degree of personalization. It allows you to transform your home on a budget, without completing a full-scale remodel. If you are a DIY enthusiast, we have good news. We prepared specially for you a DIY challenge to try on your own: the rope mirror. Place the mirror where you want it to hang on the wall and trace its circumference by using a pencil. 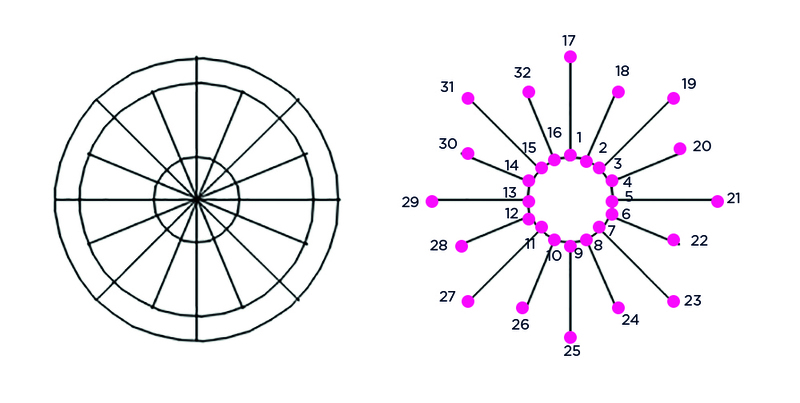 Mark the center and divide the circle into 16 equal sections. Mark with a point the places where each line meets the circle. Mark off each one of them with numbered pieces of tape. Start with 1 at the top center and continue in a clockwise direction, until 16. We’ll start with point 1. Measure a 16-inch vertical line outward, then mark the end with a point. Move to point 2, where you measure a 12-inch line and mark its end like you deed on point 1. Continue for each point, by alternating between 16 and 12 inches. You will need to mark the alter points: start with 17 at the top center then continue moving in a clockwise direction until you reach 32. Start at nail 25 and wrap around nails 11, 29, 15, 17, 3, 21 and 7, ending at 25. Start at nail 26, and wrap the twine around 12, 30, 16, 18, 4, 22, 8, ending at 26. Start at nail 27, and wrap around 14, 32, 2, 20, 6, 24, 10, ending at 27. Start at 28, wrap between 14, 32, 2, 20, 6, 24, 10, ending at 28. Now, what you have to do is to start a new series of wrapping. Start at nail 25, and wrap the twine around nails 9, 26, 10, 27 and 11. Now, you will need to continue this pattern in a clockwise direction, until you get again to 25. Without cutting the twine this time, skip nail 9 and wrap around 10, 26, 11 and 27. Continue by using the same pattern until you make it back to 10. Now, wrap the twine around each inner nail in a clockwise direction, until you complete the nail 9. What you need to do now is to apply 2 hanging strips on the back of the mirror and set it on the wall, according to the instructions. Here we go: you just created a beautiful rope mirror for your home. Each year comes with new trends in interior design and this is why we prepared for you a list with some of the most important trends in 2018. No matter the reason, when you pick a new front door, you should consider the actual or the future style and design of the apartment, especially if you already have one in plan.